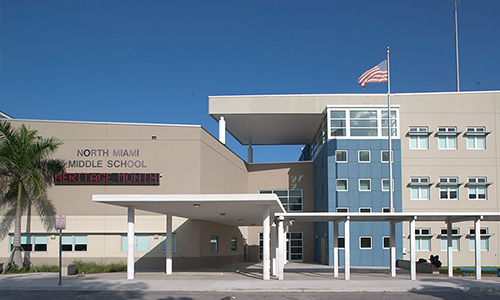 It is my pleasure to be the Principal of North Miami Middle school. We are a magnet school designed to foster student achievement within three academies: Museum, International Baccalaureate, and Communications. Our students are exposed to object, inquiry, and project-based learning. The Museum Magnet Academy provides an interactive learning environment with art and artifacts at the center of study utilizing object-based learning. Students participate in extended learning experiences at local museums, historic sites, exhibitions, performances, and on-site visitations from local artists and museum educators. The career focuses of the program are architecture, graphic design, exhibit design, business administration, marketing, education, and public relations. The International Baccalaureate (MYP) Magnet Academy provides an inquiry-based, problem-solving, highly rigorous approach to learning that infuses a global perspective in each subject area. This academy is designed to prepare students for acceptance into International Baccalaureate high school programs and to assist students in mastery of a second language. Our International Education program is well on its way to becoming an official International Baccalaureate Organization (IBO) affiliate school by meeting the stringent criteria. In addition, this program provides an outstanding avenue to enter the International Baccalaureate Magnet program at North Miami Senior. The Communications Magnet Academy offers opportunities in a wide variety of communication strands that offer real life experiences working with professionals in the industry. Based on interest, students may select from courses in journalism, broadcast communications, speech and debate, technology and graphic design. Furthermore, the infusion of technology will afford an increased opportunity for student collaboration as students present their projects through the use of laptops, LCD projectors, Promethean Boards, and iPods. Together, with the support from parents and the community, we invite you to join us in our mission to increase student achievement and to educate our leaders of tomorrow. Please stop by and see me anytime! My door is always open as I am here to serve YOU.